Liturgical Norms.. for the celebration of the Sacrament of Marriage, mandated by the Diocese of Harrisburg, are to be used for all weddings at Saint Joseph Church. Please refer to this document before making any arrangements. Use of Saint Joseph Church…is available only for the weddings of families of Saint Joseph parishioners. Scheduling…the weddings at Saint Joseph’s are at 11 AM. And 2 P.M. Meetings with…the Pastor will be made by the couple as needed. The exact number of meetings varies and will be negotiated by the priest and the couple. To prepare marriage, all couples are required to attend the established preparation programs: One option is our mentor program in which the engaged couple meets several times with a married couple to discuss the nature of marriage. This option includes a one day seminar, God’s Plan For a Joy Filled Marriage. The other option is Engaged Encounter, in which the couple spends a weekend of instruction with other engaged couples and a lead married couple and priest. The priest will provide literature with registration information for these programs. A meeting is also to be scheduled with the parish Pastoral Musician. The musician may be reached at the parish office (275-2512). Music...Music is integral to the Wedding rite. Selections should be familiar to the community, and appropriate for the liturgical setting. The acclamations are always sung. Selections are made with the assistance of the parish Music Director. Other non liturgical music may be more appropriate at the reception. In observance of the guidelines from "Music in Catholic Worship”, the music is led by a trained Cantor, who leads the participation of the assembly. The cantors must be trained and approved cantors of St. Joseph’s, or of another Catholic parish. Clergy...The Pastor is responsible for parish Weddings and is the usual main celebrant. However, with permission from the pastor, other priests may preside, concelebrate or preach. Clergy of other denominations have a limited role during Mass. 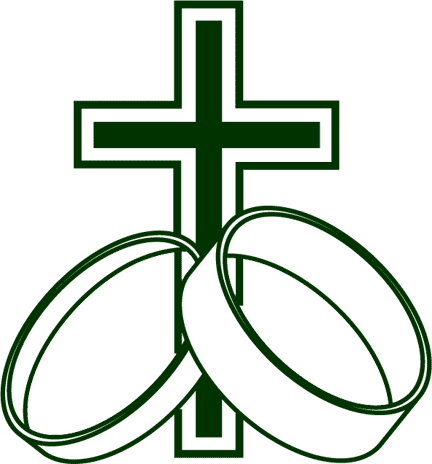 Fees…are to be made payable to Saint Joseph Church at the time of the Wedding rehearsal. Organist Fee-$150.00 (if there is a separate cantor there is an additional fee of $75.00) Celebrant Fee-Freewill offering-although suggested donation is $150.00. Church fee: Freewill offering-although suggested donation is $200.00. Check is made out St. Jospeph Church with the different amounts broken down on the memo line. If altar servers are requested, a separate donation may be made directly to the server at the discretion of the wedding party-suggested amount is $10.00 per altar server. Rehearsal…occurs the night before the marriage celebration. The following items are brought to the rehearsal: orders of worship, marriage license guest book, and the church fee. The lector should also be present for this rehearsal. The musicians however, will have their own practice.